Motorola has already released three smartphones this year, but it appears it's not done yet. 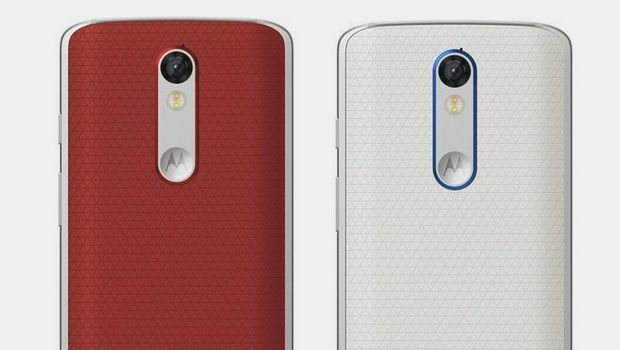 The as-yet-unannounced Moto X Force has leaked once again courtesy of a familiar source. @upleaks is up to his old tricks, revealing the mysterious Moto X Force is white, blue and red variants. We've already seen two renders of the handset, but this is certainly our best look yet. So what are the talking points? Well, like the Moto X Style (which impressed in our hands-on review), the Moto X Force seems to have a front-facing camera with LED flash. It also appears to have two speaker grilles below the display and maybe even a fingerprint sensor, although we're not so sure about that one. From what we've heard, it will sport a shatterproof, 5.4-inch Quad HD display, while being powered by an octa-core Snapdragon 810 processor. The handset should also feature 3 GB of RAM, 32 GB/64 GB of storage space, a 21 MP rear camera, and a whopping 3760 mAh battery. Not bad, ay? The Moto X Force will be the last of Motorola's 2015 line-up, which already includes the Moto X Style (aka Moto X Pure Edition), Moto X Play and the recently refreshed Moto G. With a rumoured launch date of December, Motorola could be Samsung's main Android rival going into Christmas. Like all things Motorola? Check out our hands-on review of the new Moto 360.